Home / What is a folio? Here for the first time? Learn what a folio is and how to get started on your first project. 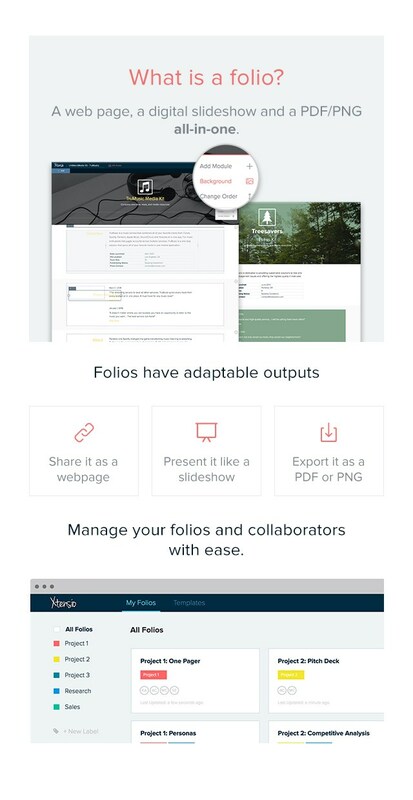 A folio is a digital slideshow, a responsive web page and an exportable document all-in-one. A folio is also your editing environment where you’ll use different building blocks and the toolbar to create your finished folio. A folio can be created either be starting with one of Xtensio’s pre-made templates or stretching your creative wings and using the blank slate tool to create something from scratch. Your folios are responsive to all screen sizes. And all edits are automatically saved and synced across all devices. To spark your creativity, we’ve created guiding templates and editable examples for entrepreneurs, marketers, strategists, consultants, researchers, designers, project managers and more.